Our Story Needs No Filter by Sudeep Nagarkar is his ninth novel and he is again telling a story that can melt your hearts. Sudeep, an award-winning romance author, has written Our Story Needs No Filter that brings out the dark shades of relationships on the backdrop of student politics. The story of the novel Our Story Needs No Filter by Sudeep Nagarkar revolves around Raghu, a college boy who knows nothing except his books, let alone girls and love. The second character of the book is Ruhi and when these two meet, love plays out its role. College is not only about first relationships or breakups, another hyped event is college elections. When Raghu and Ruhi are newbies in love, Raghu gets trapped into a mess that he cannot handle alone. His closest friends come together with a plan to change the scenes for him. They were able to change the situation but only to worsen it unfortunately. 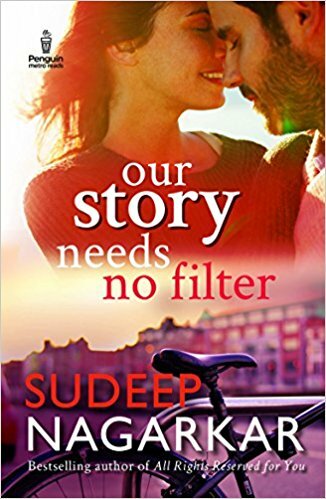 Sudeep’s latest novel, Our Story Needs No Filter, is all about whether Love can turn the table for Raghu and sail through the odds or the wicked campus politics will ruin things once and for all. To get a copy Our Story Needs No Filter personally signed by Sudeep Nagarkar, you have to pre-order your copy now! This is a pre-release review of Our Story Needs No Filter by Sudeep Nagarkar and it will be updated after the release of the book i.e. 26 July 2017.